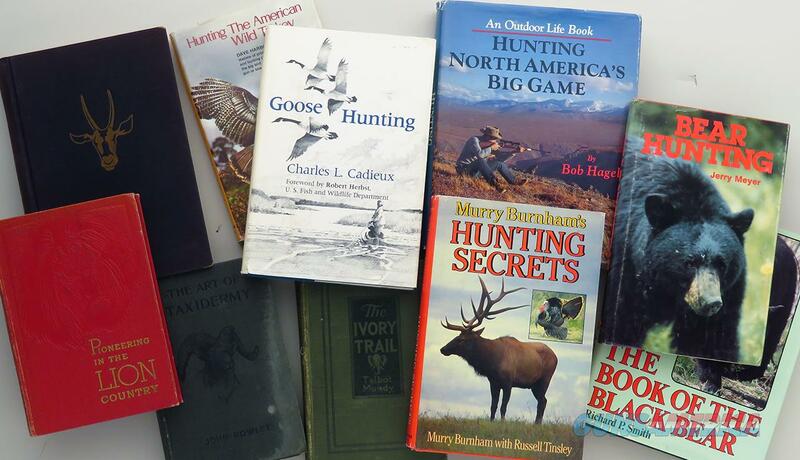 Description: Ten hunting and related books, including Horn of the Hunter by Robert Ruark, Doubleday, 1953, good with gift inscription; Hunting the American Wild Turkey by Dave Harbour, Stackpole, 1975, excellent with lightly chipped DJ: The Art of Taxidermy by John Rowley, Appleton, 1919, fair; Pioneering in the Lion Country by W.H. Branson, Southern Publishing Association, 1938, good with gift inscription; Hunting Secrets by Murray Burnham, Winchester Press, 1983, excellent with lightly chipped DJ; The Ivory Trail by Talbot Mundy, Burt, 1919, fair with soiling and bumps, repaired binding; Goose Hunting by Charles Cadieux, Stone Wall Press, 1979, excellent with lightly chipped DJ; The Book of the Black Bear, Richard P. Smith, Winchester Press, 1985, excellent with chipped DJ; Bear Hunting by Jerry Meyer, Stackpole, 1983, excellent and Hunting North America's Big Game by Bob Hagel, Outdoor Life, 1986, excellent with chipped DJ. The price is firm. Photos by request (include direct email address).